Viewed from space at night, the north of England contains some of the brightest points in the latticework of light covering the world, 15 million or more people living inside urban conurbations which hug estuaries, line coasts, sprawl in basins and straddle mountains. This density of population is hardly surprising. Here, at the turn of the nineteenth century, the new civilisation of mills, factories, and coal-fired capitalism was cradled, until it became a giant that would grow to global proportions. The “melancholy mad elephants” of Manchester’s cotton industry; the fiery forges of Sheffield; the dark woollen mills of West Yorkshire; the leviathan-spawning shipyards of Tyneside; all are now mostly gone, their energy displaced to China or South Asia, but the towns and cities they spawned remain. You’d be forgiven for thinking this landscape would be an unlikely place for nature, beauty or open space – but you’d be wrong. Powering that industrial explosion was the force of nature: fast-flowing waters running down from peat-soaked moors; the rain-soaked Atlantic climate; the presence of sturdy gritstone; ancient energy locked in coal; limestone for flux; oak forests for furnaces. Many of these things emanated from the Pennines, where much of that wild power still remains – along with England’s first, and arguably still best, long-distance walking experience. You could describe the Pennines as a mountain range, though you won’t find serried ranks of peaks, angular arêtes, or snow-capped Matterhorn-like pinnacles here. The tallest point, Cross Fell, is a mere 893 metres high, hardly enough to even bite at the hells of an Alpine giant. A better way to think about the Pennines is as an upland ocean, a tossed sea of moorland crests and valley troughs stretching for 200 miles, from virtually the middle of England to the Scottish border. In 1935, Tom Stephenson, a journalist and keen outdoor activist, received a letter from two American women asking if England had a long-distance trail equivalent to the USA’s 2,200 mile Appalachian Trail. The answer was a rueful no (and not simply because England would need to be about four times taller to accommodate an equivalent trail). As the famous mass trespass on Kinder Scout had highlighted so vividly three years earlier, walkers were barred from walking on huge swathes of England’s uplands. It would take 30 years of campaigning, cajoling and convincing for the idea to become a reality. On April 24 in 1965 (the same date as the Kinder Trespass), the Pennine Way was finally officially opened in the Yorkshire Dales village of Malham. Hundreds of walkers streamed down the hillsides to convene on the launching ceremony, a reminder the genesis of the Pennine Way wasn’t in tourist calculation or marketing gimmickry, but in a radical social movement. Later, in 1985, Tom revealed his aim more openly: "The mass of people should have the right to roam, rather than a few should restrict access so that they might indulge in their senseless slaughter. That is why the Way starts at Kinder Scout rather than as Wainwright suggests at Axe Edge. For Kinder was the cockpit of the battle for access. I must admit though that some of my friends and supporters would have taken the Way round Kinder rather than face the Enemy." But let’s put history aside for a moment and look at the walk itself. Received wisdom holds the route should be walked from south to north, usually for reasons of wind and rain direction, but it also makes good geographical sense to do it this way. The trail begins in Edale wedged in on either side by the cities of the north, and while Kinder Scout, Bleaklow or Black Hill are wild and remote-feeling, signs of modernity are never too far away: the sight of sprawling Manchester, pylons marching across the moors, the crossing of the thunderous M62, the sky criss-crossed by aeroplane contrails. But as you head north, the landscape begins to open up, and when you reach the Yorkshire Dales there is a sense of crossing a frontier of sorts. Older ways of life begin to be felt, a rural texture preserved by the remoteness of valleys and dales, and there is now very little between you and the central belt of Scotland. 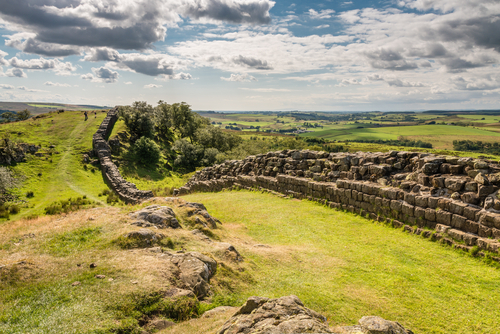 By the time you get to the northernmost settled extent of the Roman Empire at Hadrian’s Wall, the sense of having been in another realm, set apart from the relentless buzz of modern life, will have been well and truly absorbed. While the Pennine Way might have its origins both literally and metaphorically in the urban north, it leads into realms that are altogether wider and wilder. But it’s not all high-altitude bog-trots. 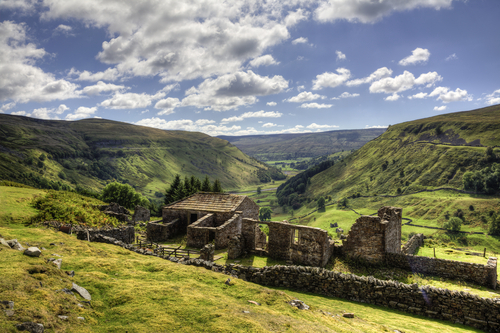 There are stretches of some of the most exquisite countryside in England; see the multicoloured meadows of Swaledale, or the succession of achingly picturesque villages passed through along the whole route of the walk. And these days, Black Hill (along with its brothers of Bleaklow and Kinder Scout) has been transformed by the extraordinary restoration work of Moors for the Future. Where once there were oceans of bare peat, blackened by pollution, now there is trembling wild cotton, swaying grasses and chirping birds (and many of the boggier sections are now paved, making the journey over those sopping moors much easier – a merciful blessing or a form of cheating, depending on your point of view.) Locked up in these moors is 10,000 years of natural history, now hopefully safe for future eons. Certain natural and cultural characteristics are common along the length of the Pennine Way, but within this there is a remarkable diversity of detail. The geology is a case in point. The underlying rock of its southern section is gritstone, a gloomy stone when set in a nineteenth century mill, but a thing of remarkable beauty in its wild form (see the awe-inspiring wind sculptures of Kinder Scout and Bleaklow). 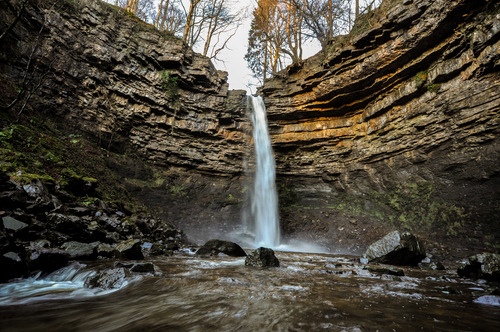 As you head north, into the white, water-carved limestone of the Yorkshire Dales, the landscape lightens and delivers spectacular surprises like Malham Cove (the most awesome freak of limestone geology in Britain) and waterfalls that look stolen from a South East Asian jungle (see Hardraw Force or High Force). Then in the remote reaches of the North Pennines, upswellings of igneous (volcanic) rocks form the foaming cataract of Cauldron Snout and the vast glacial amphitheatre of High Cup Nick. By interweaving these places, the Pennine Way reveals the under-appreciated exoticism of the north, the otherworldliness which lies beneath the image of a parochial landscape of flat caps and cafes. So how does the Pennine Way compare to the great continent-spanning trails of the USA that provided its inspiration? You won’t find bear-prowled wildernesses to match those of Appalachia or the Sierra Nevada, and the length might leave a bit to be desired. But this is the north, and for us the Pennine Way has a romanticism of its own. We don’t hit the road or stride out west to find freedom; we walk on the moors. The Pennine Way is the Route 66 of England’s great wide north, holding its own promise of freedom and escape. Among the dark satanic mills, there is room for Jerusalem after all. Eighty years after it was first proposed by a radical campaigner, the Pennine Way has been adopted by the forces of respectability, and is now one of England’s official National Trails, joined by 15 other walks made in much less momentous circumstances, but all of which are heavily touted by government for the contribution they make to the health and wealth of the country. How did this historical irony come about? One of the results of the Pennine Way’s popularity has been the creation of a whole rural economy along its route, sustaining shops, hostels, hotels and pubs. This model has been recreated across the world; now hiking forms the backbone of whole tourist industries in some countries, and in Britain the government sponsors outdoor recreation to the tune of millions of pounds. The authorities have come late to the truth which Tom Stephenson and the Kinder Scout trespassers knew well – that access to the hills enriches and inspires our culture. Yet in their time they were met with staunch opposition from the landowning class, and it took decades for their aims to be realised. Which side has history proved right? On 25th April, National Trails is staging a mass walking event called Walk the Way in a Day to celebrate the Pennine Way's 50th birthday. The organisation has mapped 50 circular walks that between them cover the full length of the trail. BMC hill walking ambassador Chris Townsend will be leading the speakers at the annual Spirit of Kinder event, celebrating the Kinder Trespass, the Pennine Way and the Peak District moors. It will be starting in Edale village hall at 2pm. If you can’t join the walk then the BBC is broadcasting a four-part documentary on the Pennine Way this month. The next episode airs on Friday 24th April and the previous installments are available on iPlayer. Highline Art Exhibition at the South Square Gallery (01274 834747) features artists’ perspective of memorable experiences on the Pennine Way and will be open until 24th May. Can’t make it to the South Square Gallery? Contact Simon@northpenninesaonb.org.uk to see an online exhibition featuring 50 sketches and paintings of the Pennine Way. April 24th will see the inauguration of the Hebden Bridge Route - a diversion of the Way through Hebden Bridge and Heptonstall. Edale is set to host a range of activities on the weekend of 25th April to celebrate the anniversary. 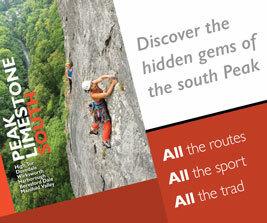 Check out the Peak District National Park website for more details. The Dales Countryside Museum at Hawes is currently hosting a Pennine Way-themed exhibition. Fancy a walk on the Way this weekend? The North Pennines AONB is organising a circular stroll from Langdon Beck youth hostel on Sunday 26th. See their website for more details. According to the Pennine Way Association, Radio 4 has programmed a three-part series on 7th, 14th and 21st of May, which will feature musicians, poets and storytellers associated with the Pennine Way. Donate to the BMC's Access and Conservation Trust (ACT) to help fund projects to protect our cliffs and mountains. Does Scotland have better access to the countryside than the rest of Britain? Wilderness walker and BMC ambassador Chris Townsend will give his view when he speaks at the annual Spirit of Kinder event in Edale this Saturday. “Among the dark satanic mills, there is room for Jerusalem after all.” Hi there, what you meant saying that?